Toronto- With more wind turbines coming to Eastern Ontario, there has been a lot of talk about what happens when it comes time to take down the towers. 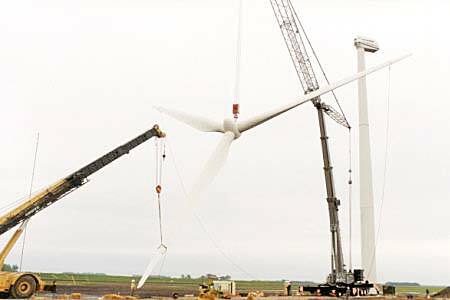 While the provincial government may put the onus on wind project developers to pay for teardown, it’s far from certain they’ll be able to collect if a company goes bankrupt — which could mean taxpayers are on the hook, says a Toronto-based environment and municipal lawyer. “Many of these companies are relatively small, or based outside of Canada, and that creates what appears to be a real risk as there will be no pocket you can go to 20 years from now when a cleanup is actually required,” says Eric Gillespie, who has represented landowners and municipalities with wind turbine concerns. It’s anybody’s guess who would end up paying for decommissioning — the landowner, the municipality, or provincial taxpayers, he says. While Ontario costs are yet unknown, world-wide decommissioning has ranged from $30,000 to $80,000 per turbine. But the worst case scenario can be avoided if funds are set aside as part of the approval process, suggests Gillespie. Decommissioning plans are required to get renewable energy approval but they don’t have financial strings attached. There is already a good model in place, says Gillespie. Under the Environmental Protection Act, the government will ask for financial assurance if there is a risk of adverse effects that could require remedial work. A letter of credit or security is required up front. I hope this all gets figured out sooner than later because once we have these turbines turned off in rural Ontario and our lives restored and all victims fully compensated for the grief they’ve had to endure and their financial losses, then we’ll have to see to it that these the turbines are dismantled and recycled.